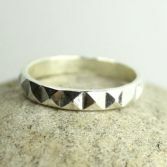 This stylish Pyramid Band Ring is made of solid sterling silver which measures 3.5mm wide and is handmade and finished in my workshop by me! 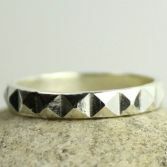 The Pyramid Band ring looks great worn alone or it can be combined with our other stacking rings to create an individual look as shown in one of the images. 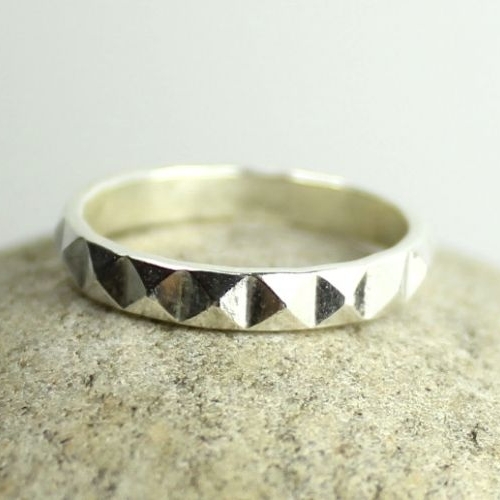 The Pyramid Band is available in two finishes bright silver or oxidised blue black finish. 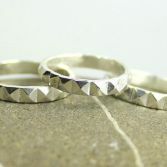 Your Pyramid Band ring has full UK Hallmarks stamped by the Edinburgh Assay Office. The price is for one pyramid ring only. 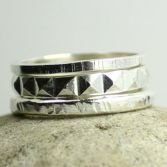 Your Pyramid Band ring will be presented in a gift pouch and posted via Royal Mail 1st Class (signed for) and delivered to any UK address free of charge.